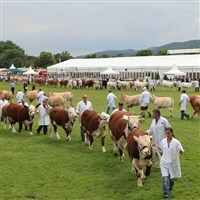 The largest agricultural and countryside show in the region offering a superb day out for all ages. Remains the largest agricultural and countryside show in the region offering a superb day out for all ages. Over the three days, the event showcases the best of British food, farming and rural life through a varied and full programme. If you are interested in supporting the countryside, seeing magnificent animals, rural living and country pursuits or even just want a fun day out with the family then this is place to be. With over 200 years of experience the society remains dedicated to supporting agriculture and the rural community and we want you to join us. Regional Food & Drink Village - Cookery demonstrations from the experts' offering delicious recipes to take home and try. The Regional Food & Drink Hall includes top quality food and drink producers from around the country and hosts the superb Cheese and Cider shows. PLUS demonstrations on how to make your very own cider!